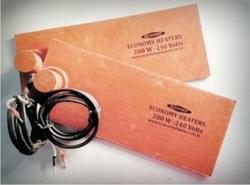 silicone rubber heaters are rugged, yet thin, lightweight and flexible. Use of these heaters is limited only by the imagination. Heat can be put where it is needed. 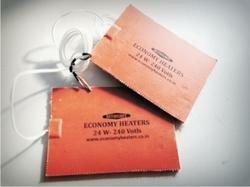 These silicone heaters improve heat transfer, speed warm ups, and decrease wattage requirements. Designed to fit Griffin and standard size beakers using a hook and loop closure for quick installation and removal. 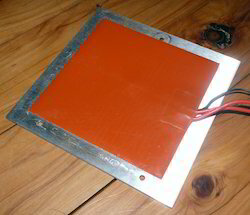 Heating element is laminated between two layers of 15 mil fiberglass reinforced silicone rubber. Compatible Power Wattage 25/ Voltage 230 Volts AC. 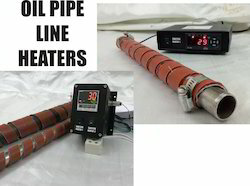 For Chorine manifolds and also in gas plants, The Drip leg Heater provides great utility. 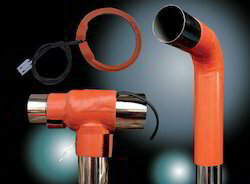 Economy Flexible Silicon Heaters are ideal choice for condensation inside the pipes. This saves good many problems and helps in smooth running performance. 1) Condensation Inside Lines Avoided. 3) Comes Available With Thermostat If Required. 5) Easily Fits On Pipe Of 25mm Od 33.5 Od. Pipe E Length 200mm. Our company is concerned with the manufacture, trade, supply and export of Silicone Heating Pads that are available at affordable price. Proffered with adjustable thermostat, the proposed compilation is vastly acclaimed for its durability, reliable performance and high effectiveness. Offered range is handed over in standardized packaging, so as to prevent damages during transportation. Silicon rubber tubing made of 45 shore A natural rubber and is easy to install because of its good elasticity and flexibility. It is light, supple and wear-resistant with good impermeability. As it provides good chemical resistance to acids and bases, These Tubes are ideal for handling liquids in the food and beverage industry and also medical instruments and in the general industry. Heavy wall sizes are available for semi-vacuum and vacuum applications generally manufactured as per order. 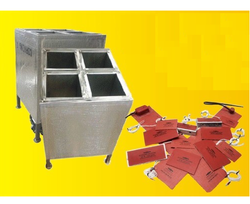 Industrial Wax Heaters wax melting require slow worming and this is provide by our silicon pad heaters. Models for both metal and poly drums are available. 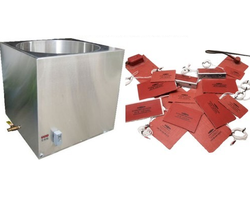 Metal Drum heaters are supplied with high watt-density while plastic drum heaters are supplied with low-watt density. mat and, in some cases, vulcanized directly by us onto your metal parts. 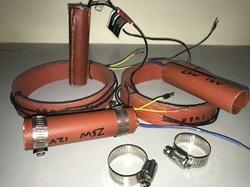 insulation, fuses, thermal cut-out devices or temperature sensors are available. 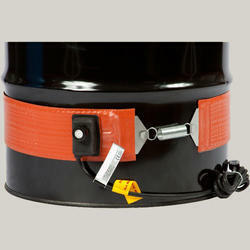 The ECONOMYHEATER - Side Drum Heater is an easy and actual aid to the warming of steel barrels. It has got a higher efficiency than the Insulated Jacket , but no thermal insulating function. 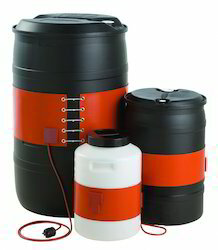 For a very quick heating and higher temperatures up to three drum heaters can be used simultaneously for a 200-liter barrel. The Side Drum Heater is available in four standard sizes (25 / 50 / 105 / 200 liters) and can of course be made to measure, too. Side Drum Heaters are suitable in particular to defrost frozen or other products, thus allowing to empty the barrels rapidly. Soaps, fats, varnishes and oily products can be melted as well, respectively reduced in their viscosity. In addition, the 200-liter element can be used in conjunction with the Base Drum Heater to shorten the heating-up time further. Excellent solution for a wide range of poly and metal drum heating applications. Can be used on metal and plastic drums. 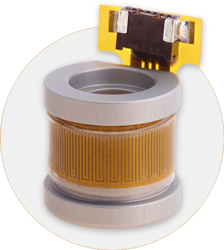 The line of Heat flex silicone wire wound heaters is designed for high flex medical device applications. They can be used for a variety of diagnostic and medical instrumentation applications. Wire wound flexible heaters feature freeze protection, condensation prevention, high watt densities, resistance to many chemicals, and excellent repeatability. 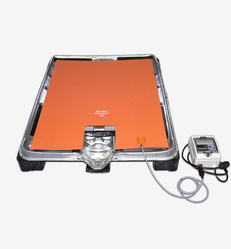 Heating mats are manufactured to order and their sizes and shapes can be adapted to each situation. 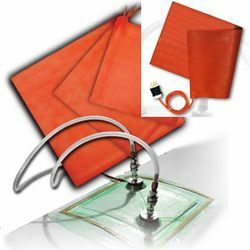 They can be fixed using eyelets or hooks incorporated into the heating mat and, in some cases, vulcanized directly by us onto your metal parts.An adhesive backing can also be provided. Other options such as double insulation, fuses, thermal cut-out devices or temperature sensors are available. In industrial instruments tubes etc. We have many flexible solutions for these applications. Our company is concerned with the manufacture, trade, supply and export of Silicone Heating Pads that are available at affordable price. Proffered with adjustable thermostat, the proposed compilation is vastly acclaimed for its durability, reliable performance and high effectiveness. Offered range is handed over in standardized packaging, so as to prevent damages during transportation. 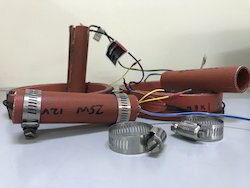 The heaters can be realized according to customer specifications, can be provided with adhesive, either on one or both sides, completed with connectors, connection cables, control thermostats, limiters, sensors, NTC probes, PT100, probe support pockets, diodes, slots, etc. Flexible heaters offer very good heat transfer to the heat sink in a very low profile and low mass package. Because they are flexible, they can also conform to, and heat, irregular surfaces that other types of heaters cannot. TCR (Temperature Coefficient of Resistance) of custom heater alloys provide minimum resistance change when temperature changes. Heating mats are manufactured to order and their sizes and shapes can beadapted to each situation.They can be fixed using eyelets or hooks incorporated into the heatingmat and, in some cases, vulcanized directly by us onto your metal parts.An adhesive backing can also be provided. Other options such as doubleinsulation, fuses, thermal cut-out devices or temperature sensors are available. 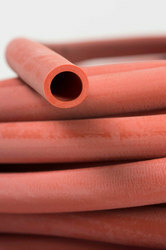 Silicone Rubber pipe provided by us are available in a variety of sizes and thicknesses. Owing to accurate dimensions, smooth finish and superlative physical properties, these tubes is extensively demanded in the market. Manufactured using superior grade rubber, the assortment of tube is non leading, non-toxic and pyrogen-free service. 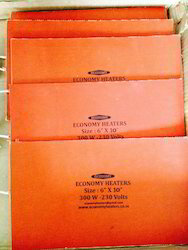 Economy Heaters 's pipe heater is specially designed for the heating of pipes, valves, and pumps. The heater exterior is wrapped with insulating material, which keeps heat dispersion down to a minimum, reducing energy usage and preventing burns when working. 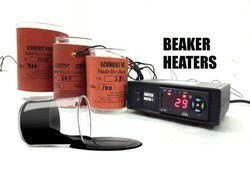 Use this heater to warm gases, control the fluidity of liquids, and for other purposes. Our heaters are made of fiberglass cloth impregnated with silicone rubber, which together provide great strength and flexibility. A wire heating element is then vulcanized between two layers of silicone rubber, forming a durable yet very flexible heat blanket that is resistant to moisture, chemicals, acids and many industrial solvents.